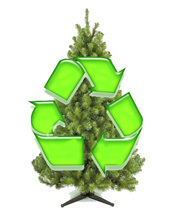 The newest edition of your community newsletter is now online, along with every past edition. Viewers can access the newsletter by clicking here, and if interested, you can view the archive of articles by clicking here. The Board is looking for volunteers who can do research on various projects and prepare feasibility studies with recommendations on which the Board can make decisions. One project that comes immediately to mind is the feasibility of locking mailboxes. We would like to have the pros and cons of any individual project laid out with all of the costs surrounding the project. Anyone who is interested should contact either Rose Weber or Janet Rourke. They can be reached at the email addresses in the Leewood Directory or at Secretary@leewood.us or President@leewood.us. NATIONAL NIGHT OUT August 2 - A Huge Success! The Fairfax County Board of Supervisors approved a higher real estate property tax rate, new vehicle registration fee and increase in the quarterly sewer service charges in order to avoid deep cuts to services next year. The supervisors voted 7-3 on a final version of the budget at an April 27 board meeting. The county spending plan will restore several programs that were initially cut by Fairfax County executive Anthony Griffin. The supervisors have added money back in to keep bathrooms open at several county parks and athletic fields for example. The Board of Supervisors was able to avoid some of the more drastic budget reductions proposed by Griffin because Gov. Bob McDonnell (R) and the Virginia General Assembly restored $61 million in funding to Fairfax County Public Schools, according to county Chairwoman Sharon Bulova (D-At-large). As part of the overall budget package, the Fairfax supervisors voted in favor of an increase of five cents in the local real estate property tax rate to $1.09 per $100 of assessed property value. The local stormwater service rate will also rise from one cent per $100 of assessed property value to 1.5 cents per $100 of assessed property value. 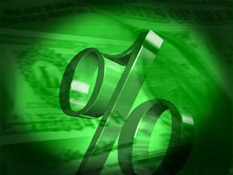 The two rate increases will be offset in a decline in home values for many Fairfax residents. The average property tax bill in the county is expected to be $26.93 less than it was last year. As part of the budget likely to pass, Fairfax would also charge a new vehicle registration fee, $33 for most cars annually. County residents would also pay an increase on sewer service fees from $4.50 to $5.27 per 1,000 gallons used, raising the average sewer bill by $60. According to Bulova, the increase in the sewer service charge is largely to help the county come into compliance with federal government mandates regarding clean water. Did you loose your printed copy? Are you looking for a past article? We have created an index of all past and present articles from the Leewood Times. 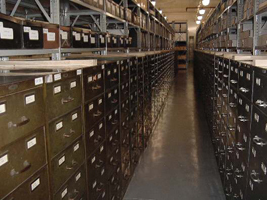 All artcles are listed alphabetically with a link to the online edition. Members can view it online in Adobe's Portable Document Format (PDF) with Adobe Reader. Leewood's National Night Out 2011 was a another successful event with many homeowners in attendance. The Leewood National Night Out Cookout was held on Tuesday, August 2nd from 7:00 to 9:00 p.m. and nearly 100 people gathered in the common area next to 5288 Bradgen Court. Hamburgers, Hot Dogs, Turkey Burgers and Dogs were grilled thanks to Bob & Lynda Flynn. Chips & Drinks and plenty of sweets were on hand as well. The Fairfax Fire department along with the Fairfax Police were there meeting our neighbors. 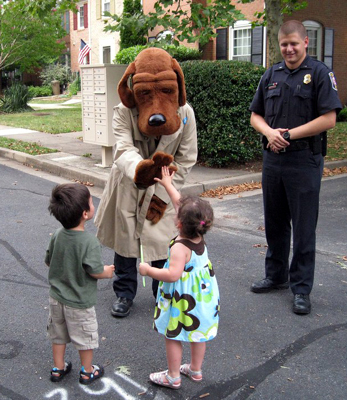 McGruff the crime dog was a big hit with the kids as you can see from the picture above. It was a great combination of new residents and long time homeowers. Thanks to everyone who dropped by to socialize and enjoy a summer meal in the company of friends and neighbors. We are in the process of gathering all the pictures and will post them here. 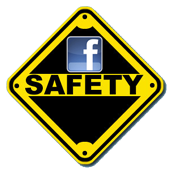 If you have any pictures that you want to post, email them to webmaster@leewood.us. Check back soon. 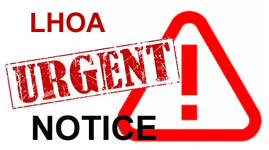 And now the Leewood.us LHOA Urgent Notice Page. In an effort to keep the homeowners more informed, we have created an URGENT NOTICE page on leewood.us. The November 8th 2008, Saturday Edition of the Washington Post included an article about our community and association. The article was titled "Can-Do Spirit Keeps Leewood Looking Sharp" and was a refreshing look at townhome communities and our fine assocation members. Click Here for a link to the Washington Post article. Government revenue problems have dampened spending on transportation improvements in the D.C. region, yet some of the biggest road and rail projects in the nation will reach significant milestones in 2011, or at least have major effects on commuting patterns as their construction continues this year. Beltway HOT lanes: By spring, lanes on the Capital Beltway from Braddock to Gallows roads are scheduled to shift right, allowing work to begin on new lanes in the middle of the highway. These middle lanes will become the High Occupancy Toll lanes when the project is done in late 2012. 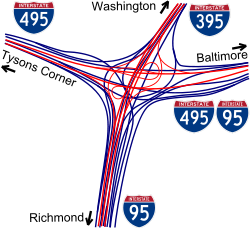 Later this year, more new bridge spans will open at the Beltway interchanges. Gainesville interchange: Work is already underway at Route 29 and Linton Hall Road. Detour roads should be in place by the summer so that construction can begin on the interchange that will eliminate the at-grade railroad crossing. The entire project, intended to relieve congestion at a long-standing bottleneck, is scheduled to be done by the end of 2014. This undated handout photo provided by AquaBounty Technologies shows two same-age salmon, a genetically modified salmon, rear, and a non-genetically modified salmon, foreground. The Food and Drug Administration pondered Monday whether to say, for the first time, that it's OK to market a genetically engineered animal as safe for people to eat. Genetically engineered salmon that grows twice as fast as the conventional fish appears to be safe, an advisory committee told the Food and Drug Administration Monday. But they argued that more testing may be needed before it is served on the nation's dinner tables. If the FDA approves the sale of the salmon, it will be the first time the government allows such modified animals to be marketed for human consumption. The panel was convened by the agency to look at the science of the fish and make recommendations on its safety and environmental impact. The struggling mall could soon be closed for good, its lofty redevelopment plans permanently shelved. Or it could be destined for a multimillion-dollar Christmas gift, with new high-rise apartments, outdoor outlets and a hotel. The Northern Virginia mall's owner, New York-based Vornado Realty Trust, has been shopping its $160 million in debt in recent weeks, leading to speculation that lenders will foreclose on the property. If the mall closed, it would mark the end of a storied shopping destination that helped define Springfield for decades. 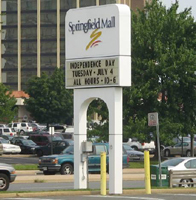 Opened in 1973, Springfield Mall was popular among families from across Washington. During its heyday in 1985, Britain's Prince Charles and Princess Diana famously visited the mall during a trade trip to see a "Best of Britain" promotion at JCPenney. The mall's managers, a family-owned group, posted news clippings about the royal couple's U.S. visit on mall bulletin boards. The mall was sold to Vornado in 2006 for nearly $36 million. Vornado agreed to invest an additional $100 million to turn the aging edifice into a "lifestyle center," with 1.1 million square feet of office space, a 225-room hotel and 2,200 apartments. At least a third of Springfield Mall's storefronts are vacant. Large swaths of the mall, with its faded gray tile and white walls, are boarded up. Store owners and shoppers alike say it's in sore need of a facelift. "The magnitude of the construction that we need out there hasn't happened, and that's frustrating," said Fairfax County Supervisor Jeff C. McKay (D-Springfield), who has campaigned heavily to redevelop the mall. Two gang-related stabbings and a fatal shooting, along with numerous vehicle break-ins and muggings, gave Springfield Mall a reputation as a hangout for rowdy youths and criminals, McKay said. Governor McDonnell plans a massive spending campaign that he said would unclog state roads, award thousands more college degrees and spur job creation, part of an aggressive legislative agenda he is expected to roll out this week. McDonnell (R) will press lawmakers to approve a series of statewide projects he said would be paid in part through Virginia's $403 million budget surplus, $337 million in higher-than-expected tax revenue, and $192 million generated through cuts and savings. And in stark contrast to other governors, who are cutting budgets and slashing payrolls, McDonnell plans to borrow nearly $3 billion over the next three years for transportation projects and intends to spend an additional $400 million to fix the state's ailing roads, $58 million to help state colleges and universities, and $54 million to create jobs. Every Virginia governor in modern times has tried to tackle the state's transportation problems, and McDonnell is no different. He already announced he wants to spend $150 million from last year's budget surplus and $250 million recouped from the transportation audit. The combination of hot temperatures and high humidity will create a dangerous situation in which heat illnesses are possible for you, your family and your coworkers. Drink plenty of fluids: Drink two to four glasses of cool fluids each hour. Your body needs water to keep cool. Drink water even if you don't feel thirsty. • Do not drink caffeinated or alcoholic beverages because they dehydrate the body. • Keep cool indoors: If you can, stay in an air-conditioned area. Resting for just two hours in air conditioning can significantly reduce heat-related illnesses. Consider spending the warmest part of the day in public buildings such as libraries, schools, movie theathers, shopping malls and other community facilities. • Electric fans may provide comfort, but with temperatures in the 90s, fans will not prevent heat-related illness. Taking a cool shower or bath, or moving to an air-conditioned place is a much better way to cool off. • Plan outdoor activities around the heat: If you must go outside, go before noon or at night when it's cooler. • Avoid strenuous physical activities or reschedule them for the coolest part of the day, usually the early morning. Limit physical activity until your body adjusts to the heat. •Eat light meals, avoiding high-protein foods because they increase metabolic heat. • Don’t take salt tablets unless directed by a physician. • Wear light-colored clothing, which helps reflect sunlight. 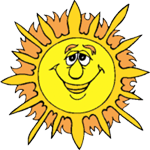 • Wear sunscreen to prevent sunburn. Sunburn makes it more difficult for your body to cool off. 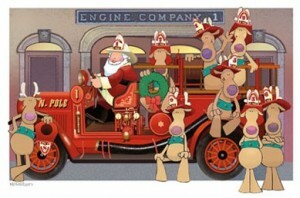 • Never leave children or pets unattended in a car—not even for a few minutes. • Ensure your home's cooling system is working properly before it is truly needed. • Make sure your home is well insulated and that you have weather stripping around your doors and window sills to keep the cool air inside. 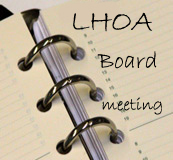 The Annual Meeting of the Leewood Homeowners Association was held on March 8th. Maggie Pitotti was reelected to the Board. Kevin Klaugherty was elected to the Board as a new member. The tax resolution passed. The by-law change was defeated by two votes. There were 39 people present at the meeting. They along with proxies resulted in 75 households in Leewood being represented. During Open Forum, the three major topics of discussion were trash in the community, excessive dog poop in the common areas and in one instance in a homeowner’s private yard and parking. The Board will consider these items during the coming months. 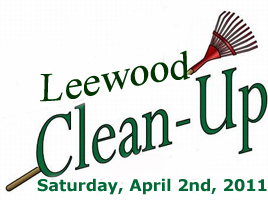 Clean-up Day will be held April 2nd. The rain date will be April 9th. Please bring gloves and rakes if possible. Refreshments will be served after the project is complete. Plan on meeting in the common area behind 7035 Leebrad Street. We hope that everyone will plan on attending at least for a few hours. -Friday, April 15, 10 a.m. to 6 p.m.
-Saturday, April 16, 10 a.m. to 5 p.m. 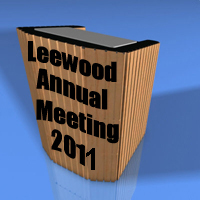 The 2011 Leewood Homeowners Association Annual Meeting will be held on Tuesday, March 8, 2011 at 8:00 p.m. at the Phillips School. 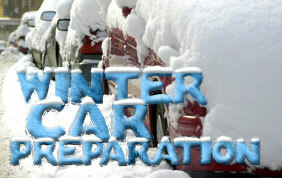 Each homeowner should have received packet in February. We strongly encourage homeowners to plan to attend the meeting or at minimum, submit a proxy so that we can establish a quorum.